How streamers are enriching the dinosaur themed survival game. Online roleplaying has been around since the dawn of the internet. Since 1975, in fact, when the first primitive Multi-User Dungeons (MUDs) were created. In recent years, our understanding of what roleplaying games are has changed—loot, statistics and levelling coming to the fore. But for purists it’s always been about inhabiting a character and seeing the world through their eyes. While roleplay, or ‘RP’, servers are still around today, it’s mostly a niche concern, restricted to underpopulated WoW realms or the persistent worlds of Neverwinter Nights. Now a new place to roleplay has emerged, from the unlikely source of dinosaur survival sim ARK: Survival Evolved. Even more interesting is the way streamers on Twitch have adopted the game, creating a new hybrid form of entertainment where viewers can watch as events unfold, talking to streamers while they inhabit their characters. Full-time streamer and games writer Debbie ‘Weefz’ Timmins likens it to “a soap opera where the viewers get to talk to the actors while the action is happening”. Also, there are dinosaurs. 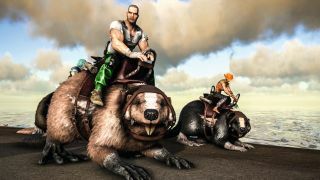 ARK roleplay’s appeal to viewers is multifaceted, but perhaps the biggest draw is that it’s often riotously funny. Characters tend to be drawn in broad strokes, their silly accents and outlandish backstories designed to make them stand out from the crowd. The result is very much a case of the lunatics running the asylum, of dinosaur-infested lands blessed or burdened with a population of misfits and comic concepts. You can be watching a streamer pottering around on a dinosaur, chatting to their viewers, only to see them abducted by the local cult. Or perhaps they’ll don glowsticks and take part in an impromptu rave, characters manically gyrating in cages while the streamer succumbs to hysterics. Perhaps my favourite creation is that of British streamer Ewan ‘NuttyAlmond’ Almond, who plays the terrifying clown Bing Bong. Bing Bong is a cheerful, rather simpleminded individual, whose life is complicated by his evil twin, Bong Bing, who lives on the back of his head. At least he did until an ill-advised, self administered medical procedure forcefully removed his face and placed on the wall of Bing Bong’s abode. Inexplicably, Bong Bing retains the ability to talk and intimidate visitors. NuttyAlmond provides the voices for both characters, the sanguine Bing Bong a stark contrast to his sinister sibling. Almond looks for inspiration in films and entertainment, attempting to find funny or disturbing character ideas. The roleplay scene within ARK continues to grow. The first and most popular server is Twitch RP, but rivals such as ArkLife and Critical Gaming have sprung up and drawn players with their varied collection of rules and mods. GameWithMe is an admin at Twitch RP, and says the server has over 1,000 whitelisted players. Around 1,000 new applications are received by the team every month, and streams can draw in thousands of viewers, particularly during the summer months when school holidays see a surge in Twitch viewer numbers across the board. It seems that ARK roleplay, and its streamers and viewers, are destined to collaborate and entertain for a long time to come.